Ennek a(z) SVG fájlnak ezen PNG formátumú előnézete: 800 × 400 képpont. További felbontások: 320 × 160 képpont | 640 × 320 képpont | 1 024 × 512 képpont | 1 280 × 640 képpont | 1 300 × 650 képpont. 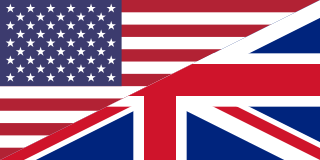 Combined flags of the United States and the United Kingdom to represent the English language. The 1:2 version of the Union Flag was scaled horizontally to match The flag of the United States. 2012. április 22., 03:12 1 330 × 700 (9 KB) AuburnPilot Reverted to version as of 04:16, 16 August 2011 - Canada is 4th by percentage and 5th by population...A maple leaf doesn't make sense or represent English.